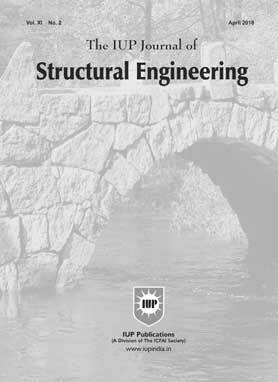 Engineering Journals | Structural Engineering | Steel Structures Construction Engineering Nonlinear Structures Cable Structures Analysis and Control of Vibrations Structural Analysis and Mechanics. It is a quarterly journal that publishes research papers that would advance the state-of-the-art practices in Structural modeling and design; Studies relating to the development, application and interpretation of results of analytical and experimental simulation techniques; New structural-systems and their advantages vis-Ã -vis Existing structures; Investigation of properties of engineering materials in the context of their structural behavior; Bridge, Dam Construction and Analysis; Repairs, Strengthening and Maintenance; interdisciplinary papers dealing with Design and Construction techniques such as Earthquake Resistance Structures, etc. Performance-Based Seismic Design (PBSD) provides a methodology of understanding the risk to life, occupancy interruption and economic loss that may occur as a result of seismic events. The methodology has two primary concerns: appropriately quantifying the uncertainties associated with the performance evaluation process and satisfactorily characterizing the damage sustained by the structure. The paper aims at assessing the seismic performance of reinforced concrete structure subjected to lateral loads. For this, pushover analysis has been performed on a gravity-based designed Moment Resisting Frame (MRF). The effort involved in the performance evaluation of moment resisting frame relates to nonlinear modeling of reinforced concrete members. The study attempted to evaluate the performance of moment resisting frame by considering two possible plastic hinge locations: at the ends of members and at userdefined location. Various performance limit states have been verified using engineering demand parameters such as displacement, base shear, storey drift, interstorey drift and response modification factor. A performance-index has been evaluated for different limit states, which reflects the capacity of the structure against the applied lateral force. An attempt has been made to correlate damage state with different performance levels. The paper deals with partial replacement of coarse aggregate with granite stones. The effect of Shahabad stone (a variety of cuddapah) and the chemical admixture (superflo) on concrete was investigated. Natural aggregate had been replaced with the waste shahabad stone in four different percentages, i.e., 20, 30, 40 and 50. A comparison was made between the specimens of partially replaced coarse and the same set of specimens admixed with superflo. The effects on durability properties were reported. The paper investigates the possibility of using Granulated Blast Furnace Slag (GBFS) as a sand substitute in cement mortar in order to reduce environmental problems related to aggregate mining and waste disposal. In this study, cement mortar mix 1:3 and GBFS at 0, 25, 50, 75 and 100% replacement to natural sand for constant w/c ratio of 0.5 is considered. The flow characteristics of the mix and their compressive strengths at various ages are studied. It is observed that GBFS could be utilized partially as an alternative construction material for natural sand in mortar applications. In recent years, a universally encountered problem in construction is expenses of the construction materials. The diminution in sources of these materials has created scarcity, which in turn has led to the upgradation in cost of these materials. Many alternatives to natural construction materials such as M-sand, mineral admixtures, chemical admixtures, etc. are arising in market. With these alternatives, adoption of structural modifications in the building can take construction to the next level of economy. The latest IS code on ductile design and detailing of RC building subjected to lateral loads (IS: 13920-2016) has included a new concept in structural systems, i.e., gravity columns, which are designed to take only gravity loads, and necessary detailing requirements of these columns are also discussed. In the present study, various models, including gravity columns at different heights of the building, have been analyzed with the help of software ETABS 2013, and the performances of the models in terms of parameters base shear, storey displacements, storey drifts, storey stiffness, periods and frequencies of various modes are compared with conventional RC building. Models considered for the study are 12 storey RC buildings with shear walls and moment resisting frames for resisting lateral loads and gravity columns to resist gravity loads as well as the displacements from the lateral loads. The lateral load bearing members are ductile designed as per IS: 13920-2016, and a comparative study on the quantity of steel reinforcement given to all the models and RC conventional building has been done. The paper concludes that adoption of gravity columns in the building has shownreduction in base shear and stiffness of the building, and there is increase in the displacement of building by 3 to 6 mm, i.e., 13.25%. The reduction in reinforcement steel is 26.90% compared to RC conventional building, leading to economic construction. Mechanics related to the study of propagation of cracks is known as fracture mechanics. Presence of cracks decreases the lifetime for which the structure is designed. Thus, crack propagation ought to be studied essentially to understand the stability of structures. Each structure contains inherent defects either miniaturized scale breaks or some other kind of split in concrete. So, it is very important to understand the behavior of the materials in order to predict crack propagation in the concrete. Fracture mechanics plays a very important role in dealing with such problems related to cracks in concrete. To be accurate in the analysis, it considers elasticity and plasticity in order to find out the macroscopic mechanical behavior of the materials. The load deflection of the crack of the beam is mainly due to stress crack opening relation. The results obtained from the various tests are sensitive from the production of the beam specimens and the execution of the tests depends on the size of the beams. It is observed from tests that the various size effects of the beam changes depend on the length and other parameters. The parameters may greatly vary as the size of the beam varies from higher to lower.